Backing/Stabilizers » Embroidery Talk Has Moved! EnMart is proud to announce that we have added puffy foam to our product offerings. For those who are not familiar with this product, it is a square of colored foam, generally 2 mm or 3 mm thick, which can be embroidered over to give a puffed look to your design. Once the embroidery has been completed, the excess foam is torn away, leaving one section of your embroidery with a 3-D appearance. Currently EnMart offers black, red, orange, blue and light blue puffy foam. Other colors should be added in the near future. Puffy foam is a great way to make your embroidery stand out, adding dimension and an additional element of interest. It is great for baby bibs, sweatshirts, tote bags, Greek apparel and much more. If you plan to use puffy foam in your sew-out, the design must be digitized specifically for use with puffy foam. To sew out a design using puffy foam, first sew all the elements that won’t incorporate foam. Once those elements are completed, take your sheet of puffy foam and lay it over the sewn design. It is recommended that the color of the puffy foam you use should be similar to the color of the thread you use to sew out your design. Your machine will then sew over the foam securing it to the fabric and incorporating it into the design. Once the complete design has been sewn, excess puffy foam can be pulled away, leaving only the sewn over pieces as part of the overall embroidery. Since Today is Earth Day, it seemed like a good day to include eco friendly backing in our Backing Basics series. As has been explained in the past, backing is made up of polyester fibers and viscose, which is the filler that holds the poly fibers together. Environmentally friendly backing is made the same way, it is just the content that is different. Eco friendly backing is made up of recycled plastic fibers and wood pulp or recycled cardboard. The quality of the backing is still high, but the impact on the planet is much less. If you are interested in reducing the impact of your backing use, here are some backing options you may want to consider. Biodegradable Tearaway Backing – This backing is designed using only natural fibers which are renewable, sustainable and biodegradable. This backing breaks down into individual fibers when agitated in water, alleviating the need to dispose of excess backing. This backing has been engineered to been engineered to pass biodegradability tests NF U52-001 or ISO 17556 and ASTM D6094-97 test. Hydro-Stick Adhesive Backing – This adhesive backing activates with water. It eliminates the need for aerosol adhesive sprays, and has an all natural adhesive. This backing also virtually eliminates the gummy residue that can accumulate on needles and embroidery machine parts. Badgemaster – This backing/topping is a translucent, water soluble, embroidery film. It is ideal for applique and for embroidery on stretch fabrics like Lycra. Embroidery can be sewn directly into the film, so no fabric is required. Badgemaster is biodegradable and non-toxic. EnMart is always on the look-out for products and methods that can help us be more environmentally friendly. To learn more about we’ve been doing, please read our post “Eco-Friendly EnMart“. When you’re first starting to embroider and trying to figure out what supplies you need and what will work best for the type of embroidery you’ll be doing, one of the mysteries you’ll need to unravel is backing weight. At first glance, backing weight seems pretty simple, after all most people have some concept of what 2.5 ounces means. Where it gets complicated is when you start to consider how the weight of the backing translates to the success or failure of your embroidery. Does backing weight really make all that much difference when it comes to embroidery? If you use a 2.5 ounce backing instead of a 1.5 ounce backing, is your job doomed to failure? What exactly, does backing weight mean, and how much does it matter? First of all, you need to understand how backing weight is measured. The weight of a piece of backing is measured by the square yard. So, if you have several types of 3 ounce backing in front of you, each type should weigh 3 ounces if you were to weigh a square yard of it. Heavier backings, say a 3 ounce backing, will be stiffer and sturdier. Lighter weight backings, a 1.5 ounce backing for instance, will be more flexible and easier to see through. The weight of a backing will have some bearing on how well the backing stabilizes the fabric into which you are sewing, but what’s really important is how the backing is constructed. Machine embroidery backing is typically made up of polyester fibers which are held together with wood pulp or viscose. 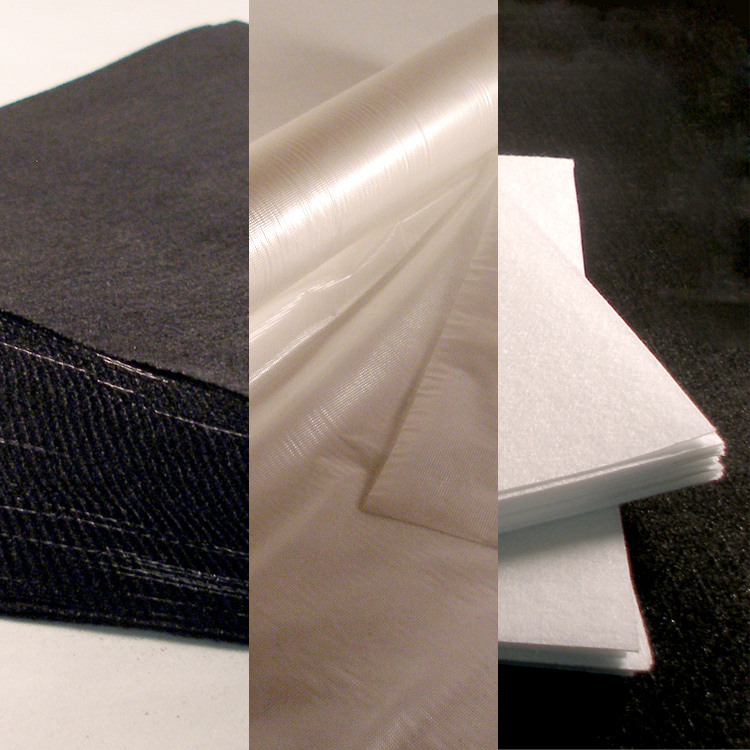 Higher quality backings tend to have more polyester fibers and less filler, lower quality backings will have less. What determines the quality of a backing is the length of the polyester fibers and the amount of the polyester that is in the material. If you want to determine the quality of a piece of backing, do a simple test, hold it up to a light source. A high quality backing will have an even density and the surface of the backing will be smooth. A lower quality backing will have high and low spots and uneven density. Since the fibers are not evenly distributed, a lower quality backing can contribute to a sew out that is uneven, or embroidery that is not uniform. Another thing to take into account is the embossing of the backing. As an example, let’s compare the standard Poly Mesh Backing with the Super Poly Mesh Backing that EnMart carries. Both are designed for sheer fabrics. Both are light weight backings. If you hold both types up to the light, however, you’ll see that the Super Poly Mesh has an embossed pattern. Even though both backings are the same weight, the embossing on the Super Poly Mesh makes it six times stronger than the regular Poly Mesh. Backing weight can have an impact on the success or failure of your embroidery, but it isn’t the only thing that matters. How your backing is made, the quality of the materials used to make it, and any techniques, like embossing, used to increase strength can also make a difference. The next time you’re choosing backing for a job, make sure you take all these items into account. To produce a high quality finished embroidered product, you need to begin with the correct backing. There are different types of backing which are suitable for different fabrics and different sew outs, and it can be hard to know which backing is right for your job. Our Backing Basics series is designed to help you make the right choice when it comes to the backing/stabilizers you use. The first thing you need to decide when determining which backing you should use, is what the requirements of the particular job are. Do you need a backing that can be torn away after the design is finished? Are you embroidering fabrics that are slightly sheer, and so need a backing that won’t stand out? Is your embroidery going on something, like a towel, that has a tendency to absorb your stitches? Once you’re got your criteria, you can then decide which category, size and weight of backing is right for you. In this installment of backing basics, we’re going to discuss backing types. Most backing falls into one of several broad categories. Today I will give you a brief description of each category. The most popular backing choice among embroiders is tearaway, allowing for jobs to be finished faster because the backing can be torn from the garment. Tearaway eliminates any tedious cutting around the design with scissors. Cutaway backing is most often used when an embroiderer is working with a light or stretchy fabric. This type of backing is sturdier and provides more stability for lighter weight fabrics. Once the design is done, cutaway backing must be trimmed with scissors. Adhesive backing has a pressure sensitive coating and a release liner. Once the design is sewn; the backing can be easily torn away. This backing is ideal for use with hard to hoop items. Most backings of this type are tearaways. This backing is used to improve the crispness of lettering and columns. Fusible backing can be affixed to a garment with a hand iron. The primary use for this type of backing is to stabilize extremely stretchy or hard to hoop materials. Poly Mesh backing is ideal for lightweight knits and sheer fabrics. This backing is soft and lightweight and can be used for jobs where minimizing stabilizer show through is a concern. Water soluble topping/backing is used with textured fabrics like terry cloth or fleece. This sort of backing prevents stitches from sinking into these sorts of material. It is water soluble and will dissolve in water, so excess topping can easily be removed. This is a brief sketch of the broad categories of backing. In the next installment of Backing Basics we’ll discuss backing weight, what it means, and why it matters.